Many random thoughts go through my head throughout the course of a normal day, particularly when I’m in a cooking-induced semi-meditative state. I think a lot about the “what if’s” in life, such as, what if the Ottomans had somehow deviated nearly 13,000km from their homeland and Australia had become part of their great Empire? What would our cuisine be like then? Would we be eating damper with spiced lamb and pine nuts? Börek with kangaroo? Lamingtons made with orange blossom water? Even our beloved Tim-Tams might have had Turkish delight in their middles rather than chocolate. In case you are wondering who the Ottomans were, a very brief history of their prolific empire is that it was founded by Turkish tribesmen in 1299 and came to an end in 1922, making it one of the longest lasting in human history. During the 16th and 17th centuries at the height of its power, under the reign of Suleiman the Magnificent, the Ottoman Empire was one of the most powerful in the world. It was a political, cultural and culinary mecca controlling much of South-East Europe, Western Asia and North Africa. The Sultan had hundreds of chefs working for him who dedicated their lives to their profession, developing and perfecting Turkish cuisine. As the Empire was so significant and far-reaching, the cuisine went on to influence the kitchens of the Balkans, Southern Russia, the Middle East, Israel and Morocco. For example there are many different versions of the ubiquitous cucumber and yoghurt dip most commonly known tzatziki ranging from Bulgaria to Iraq. Even the name comes from the Turkish word “cacik” which means chutney. Given that Australia’s (and New Zealand’s) most famous dessert is the pavlova, I thought it fitting to give her an Ottoman makeover. If she had indeed been part of a very different history, she would have probably looked like this Turkish beauty. She would have been made with pomegranates and persimmons, be scented with roses and showered in flower petals. Like a beautiful consort, she would have taken pride of place at the Sultan’s table and perhaps have even been surrounded by other resplendent Otto-Australian delights (like the orange blossom lamington). Today we might not be part of any such empire, but the enormous contribution made by the Ottomans and the Turkish people to Australia’s vast array of multicultural cuisine is unmistakeable. Without them we wouldn’t have köfte or doner kebabs, the gözleme ladies you see at every outdoor event in Sydney, and you wouldn’t have Fry’s Turkish Delight (in my opinion for that one alone we owe them a debt of gratitude). The Ottoman Empire may be no longer, but the food and flavours most definitely live on in our kitchens, in our cookbooks and on the tables from which we eat. Prep time 1 hour, cooking time approximately 2 hours. 1. Preheat oven to 220º C (approx 420˚F). Place a sheet of baking paper on three large baking trays and draw 20cm (8″) rounds. 2. Separate your eggs making utmost care not to contaminate the egg whites with any egg yolk. Any fat in the egg whites will prevent them from beating properly and will weigh them down. 3. Beat your egg whites until they are stiff and add your sugar slowly along with the vanilla essence, one tablespoon at a time and beat until stiff peaks form. Turn your bowl upside down to make sure the whites are stiff enough. If not, beat another minute or so then check again. 4. Squeeze several drops of pink food colouring into the raw meringue and fold through carefully ensuring you leave streaks of pink rather than fully incorporating it. 5. Shape the meringue into the three rounds on the baking paper/trays. Place meringues into oven and immediately turn temperature down to 120˚C (250˚F). Bake for 90 minutes then turn off oven, do not remove meringues until oven is cool. 1. Place the persimmon slices into a mixing bowl. Add the caster sugar and lemon juice and stir through ensuring all the persimmon slices are coated. Line a baking tray with non-stick baking paper and lay out them out. Bake for approximately 20 mins at 180˚C (350˚F) until persimmon slices are caramelised. Let cool on the baking trays then peel off. They will be candied and firm yet still have a little bit of bend in them. Set aside. 2. Beat the cream with the rose water until stiff peaks form. With a spatula spread a third of the cream over the bottom meringue, place the second meringue over it, spread cream over again, then top with the third meringue and spread cream over again. 3. 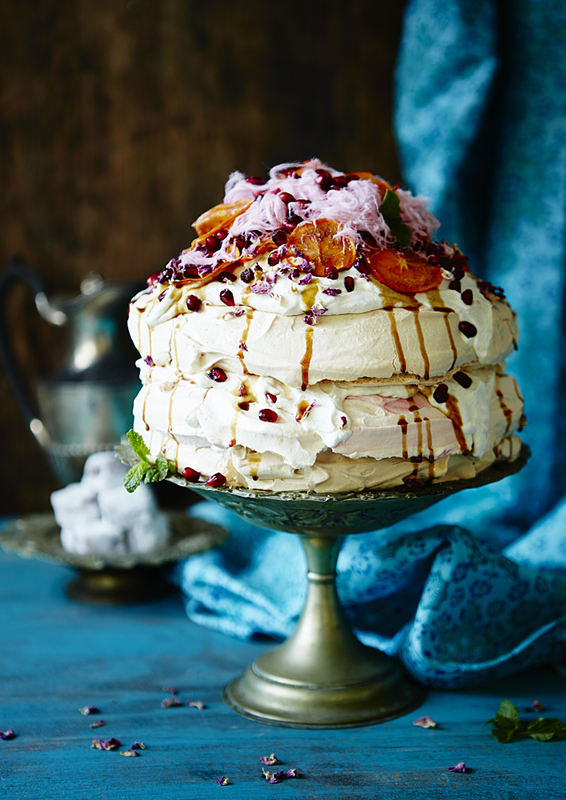 Sprinkle the pomegranate seeds over the top of the pavlova, arrange the candied persimmons on top and drizzle the whole pavlova with the pomegranate molasses. Top with the pashmak and garnish with the mint leaves. I searched high and low for a cake stand that could play the part for this shot and I found a battered vintage brass comport at a local op-shop which I knew would be perfect. The dish and water jug in the background are vintage finds from Vinnie’s and the surface and background are salvaged timber from hard rubbish collections. The Moroccan inspired fabric came from a local op-shop and the only light used in the image is window light. I love seeing how food influences travel across cultures and countries through history.. I find its all so fascinating!! So pretty. I think the ottomans would love your creation. I have had rose flavored mini pavlova but this is whole another level of exotic. Thank you for sharing the wonderful history of the great Ottoman Empire. They contributed to so many great cuisines and were so influential. The pavlova looks amazing as so your photos. This is beyond beautiful. So lush and compelling. Last year I made pavolva for the first time – you have inspired me to continue my pavlova endeavours in 2014! I just found your site while researching pavlova, and are you kidding me with this photo?! Such a stunner! This story is wonderful, the pavlova is beautiful, the topping is beautiful! I love everything about this!